We recently were contacted by Fred Williams and the Dirt Everyday crew. They wanted to take a 2017 Toyota Tacoma and 2 editors of Surfer Magazine to Baja for some surfing and to put the truck through its paces, We were happy to oblige. We had a fun time hanging out with Fred and crew, Lots of Tacos, and trails covered and many laughs with our new friends. Fred really put the truck through some challenges. Sand, dirt roads, some hill climbs. Solid little truck. 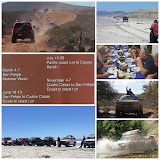 Thank you guys for coming to Baja with us!